Gareth Birchley of Berry Bros & Rudd (and Come Dine With Me fame) convened a small dinner. Birchley, who was described by Telegraph wine columnist Victoria Moore as ‘a boisterous youngster with an estuary accent and a fondness for following up Michelin-starred dinners with Dom Perignon in hot tubs,’ is good buddies with Ernst Loosen, who he refers to as Uncle Erni, and so a few of us gathered at 67 Pall Mall for a late dinner after Erni had finished conducting a tasting. I’m not a member of 67, but I have been a few times, and once again I was really impressed with the food, and especially the service. We had quite a few wines and we were dealt with brilliantly by head sommelier Terry Kandylis. I didn’t take detailed notes, but here are some thoughts on the wines. We began with a very assured bottle of Dom Perignon Rosé 2004, which is just seamless and thoroughly drinkable, in the Dom style: serious but accessible. Then we had a bottle of Pierre-Yves Colin Morey Bourgogne Blanc 2011, which at £40 on the list is a bargain, because this is proper white Burgundy. Things got properly serious with the next wine, which is Erni’s GG Reserve (an unofficial designation). This is a lovely wine. It spends two years on its lees in large oak, and it’s quite brilliant. 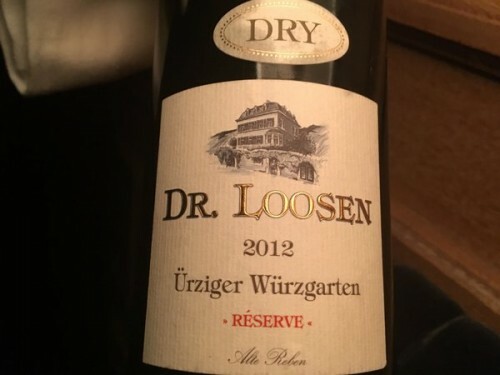 This is how dry Mosel Riesling should taste. It just doesn’t seem to be the same fermented in stainless steel tanks. We had to go to Burgundy. 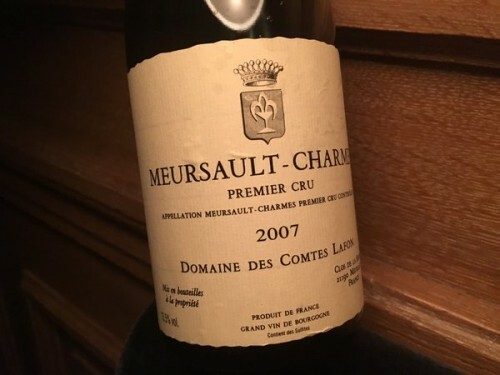 Lagoon’s Meursault Charmes 2007 was really on song. Still quite youthful but with crystalline complexity, and fortunately no hint of premature oxidation which is still such a worry with white Burgundy. Red Burgundy next, following the disappointment of a corked bottle: the 1983 Mouton, which Gareth had brought along especially for Mel Brown (a birth year wine!). 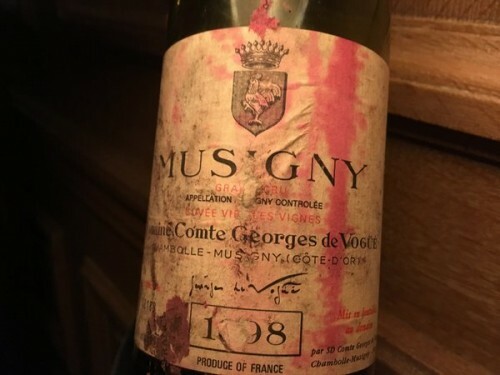 We started with De Vogue’s Musigny from 1998. The general feeling round the table was that this wasn’t as good as it should be, and that they are usually underwhelmed with De Vogue. I thought it was pretty smart, but still quite tight and firm. Sticking with red Burgundy, it was time for something a bit fleshier and richer. This was provided in the form of a Gevrey-Chambertin from Denis Mortet – the 1er Cru Lavaux St-Jacques 2006. This is quite generous and seductive, and rather tasty. To finish with: something very special. 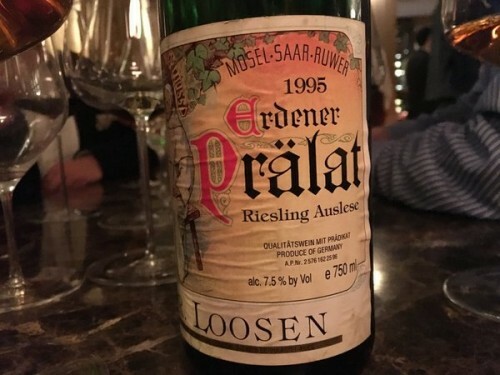 It was Erni’s Erdener Prälat Riesling Auslese 1995, which was singing. This is a special vineyard with 100 year old vines planted in slate soils, with a warm microclimate that gives it a talent for Auslese. It was a fitting end to a lovely dinner. So Jamie, how come you are not a member of 67 Pall Mall? I’m not often in the UK. I like to go to lots of places. I rarely wear a jacket. Haven’t really considered it.